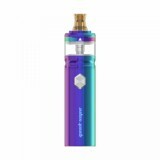 Geekvape Flint Starter Kit is a compact vape pen kit with exquisite appearance and 22mm big diameter. It consists of 1000mAh built-in Flint battery and 2ml Flint tank. Powered by GeekVape refined NS coil system, the Flint Kit can support both nicotine salt e-liquid and regular e-liquid for perfect MTL vaping. Geekvape Flint Starter Kit, a compact vape pen kit with exquisite appearance and 22mm big diameter. It consists of 1000mAh built-in Flint battery and 2ml Flint tank. Powered by GeekVape refined NS coil system, the Flint Kit can support both nicotine salt e-liquid and regular e-liquid for perfect MTL vaping. You can adjust different modes by pressing the firing button 3 times, which is very easy to operate. And it features five different airflow size and quick slide fill system, which make this kit unique and attractive. The innovative Ns coil will definitely give you intense flavor! • 3 month warranty for Flint battery. • NS 1.60ohm coil is available in BuyBest. Ideal mtl, para sustituir los pod. 작고 가볍고 솔트니코틴 액상용으로 최고의 제품! love it... cute and very good flavour. Perfect! Very solid product for beginning vapers! Very satisfied with the product. 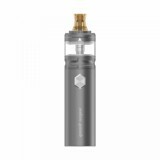 Geekvape is always my favorite vape brand, I buy this new Flint kit and it took 15 days to arrive my home. everything is working perfectly. Thanks!